As a food photographer, I find myself buying mint periodically, popping it into the occasional photograph for a bit of color. While I like to add a sprig to lemonade from time to time, mint rarely gets much use in my kitchen. The leaves are often left in the refrigerator until they are forgotten (a fate of which I am not proud). Though mint leaves are ubiquitous in Indian cuisine, my Midwestern roots have offered me fewer uses for them. I am pointed in the direction of mojitos and like minded drinks, but rarely elsewhere. After filling my refrigerator with mint recently, I decided I wasn't going to allow this batch to go unused or uneaten. After scouring the internet for dessert ideas, I came up empty handed. While peppermint complements sweets well, its minty cousin has a little less love on its side. Despite this, I challenged myself to find a way to use up the leaves. Crushing mint leaves allows the oils inside to release, creating an aromatic scent and a bright flavor. With this in mind, I grabbed a mortar and pestle, grinding the leaves together with a little granulated sugar. Mint infused sugar seemed like a great place to begin. Truthfully, after licking off the sugar that found its way onto the tips of my fingers, mint sugar was not only the beginning, but the end. 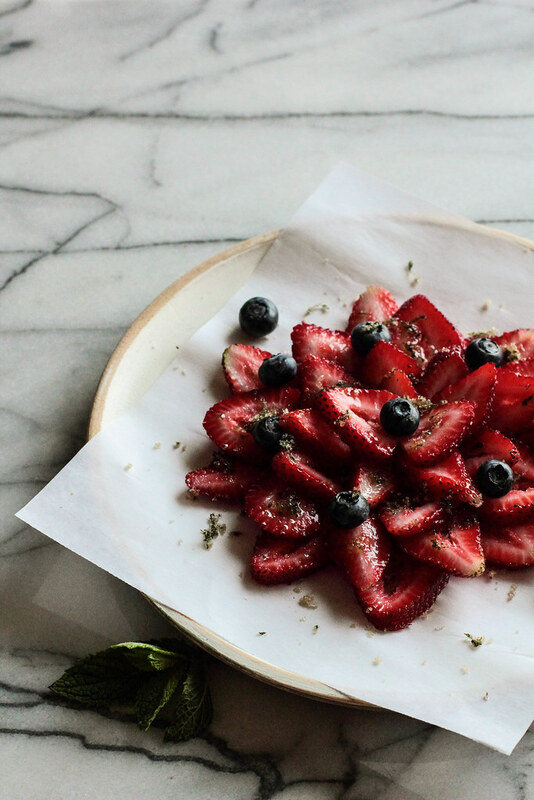 I grabbed a few strawberries and blueberries from the kitchen, sprinkled the mint sugar on top, and called it a fruit salad. The mint sugar, while subtle, elevated the salad into something special. Later, I macerated strawberries in the sugar before spooning them over shortcakes. 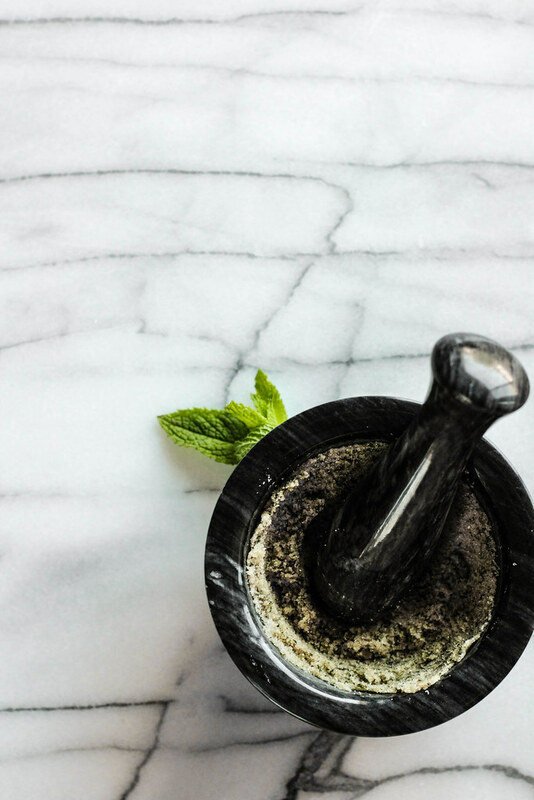 The mint sugar has a range of uses, from sweetening fruits and salad dressings to adding a bright pop on the tops of sugar cookies, making it a versatile tool in the kitchen. Mint Sugar is an infusion of mint into granulated sugar. The ratio of mint to sugar is 1:2, which means that the recipe can be made as large or as small as you choose. While the mint sugar will keep in the refrigerator for a day or two, it is best when it is freshly made. 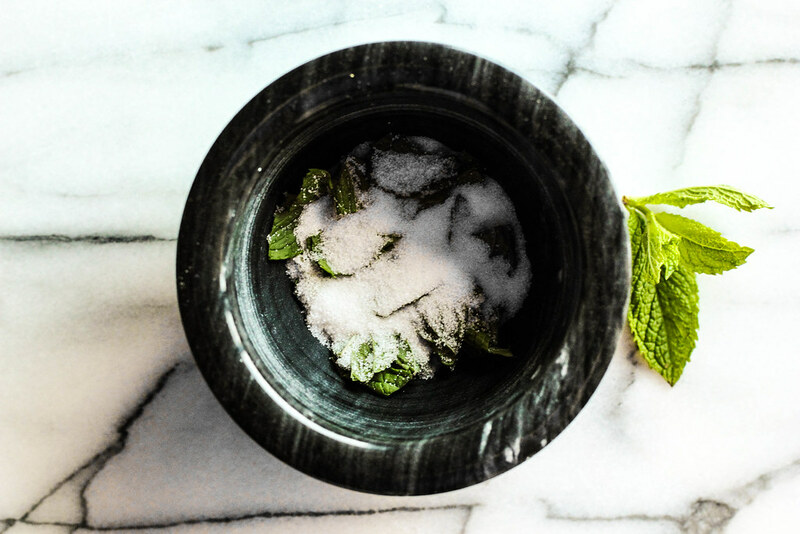 Whether you rim it around your next cocktails or sprinkle it onto your next fruit salad, mint sugar is a quick fix that can help your next dish sparkle. The spring sun has struck me with an incurable fever. Even though snowflakes were falling from the sky just this morning, I long to shed my winter coat and find myself no longer craving the hearty soups and dishes of winter. My mind has begun spinning towards lighter fare and short sleeves. 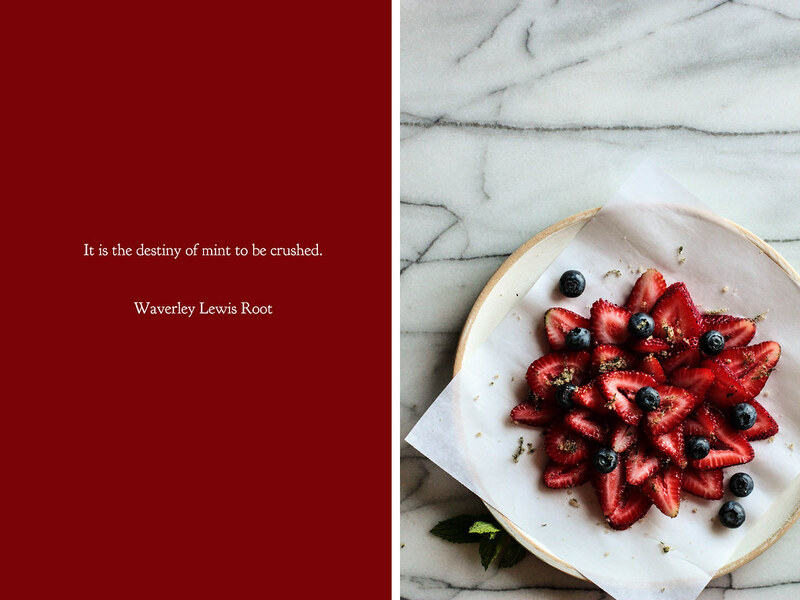 I have begun craving the sweetness of a ripe strawberry and the bold tartness of a stalk of rhubarb in vivid detail. If I shut my eyes tightly, with the sun streaking through the window late into the evening, I can almost pretend the world outside is green and ready to be planted with seeds of rebirth. I shall never take for granted the arrival of spring again. Craving a feeling, person, or place brings out a yearning in our heads all the way down to our toes. When our heart's desire is out of reach, we find a way to bring it closer through hope and longing and daydreams. These wishes, both small and large, sustain us as we wait for our cravings to be sated. They sustain us until our cravings come to pass. I am craving spring. I am craving green grass, the smell of new growth, the touch of a warm sidewalk, the sweetness of a beautiful, red ripe strawberry. The hunger grows daily. As the sun sets later each evening, my appetite becomes insufferable. Knowing warmer weather will be around the corner keeps my spirit up as I dream of the long walks I will take once this winter is done. A "fool" is a traditional English fruit dish originating in the sixteenth century. The dessert was most commonly made with gooseberries, but a variety of fruits from raspberries to apples can be used its place. The three main ingredients to a fool are pureed fruit, whipped cream, and a sprinkling of sugar. 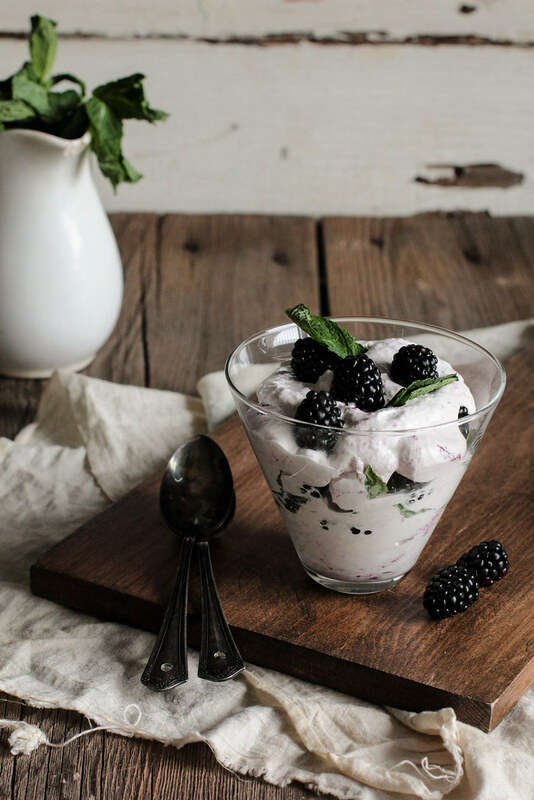 For this Blackberry Fool, I used fresh blackberries with whipped cream and a seedless blackberry jam. This may be a more modern take on a traditional dessert, but the result is the same—delight. 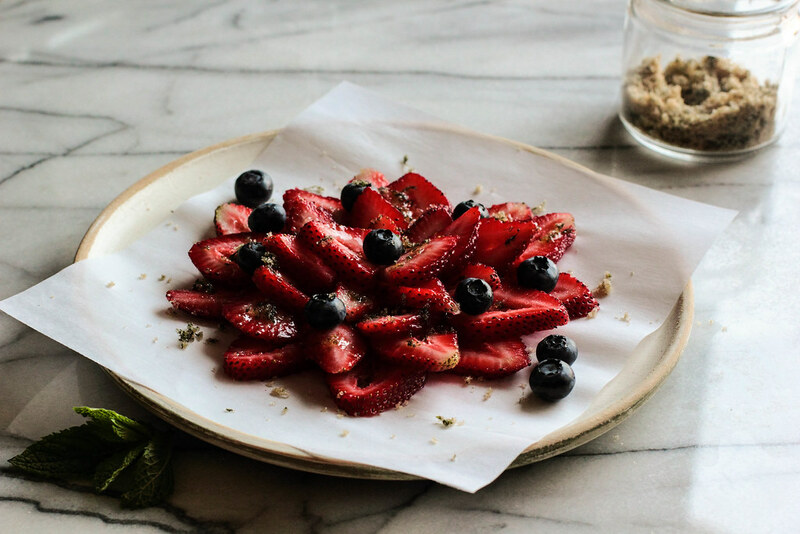 Feel free to try out other berries with matching flavors of jam, such as blueberries or strawberries, to play around with flavors and preferences. 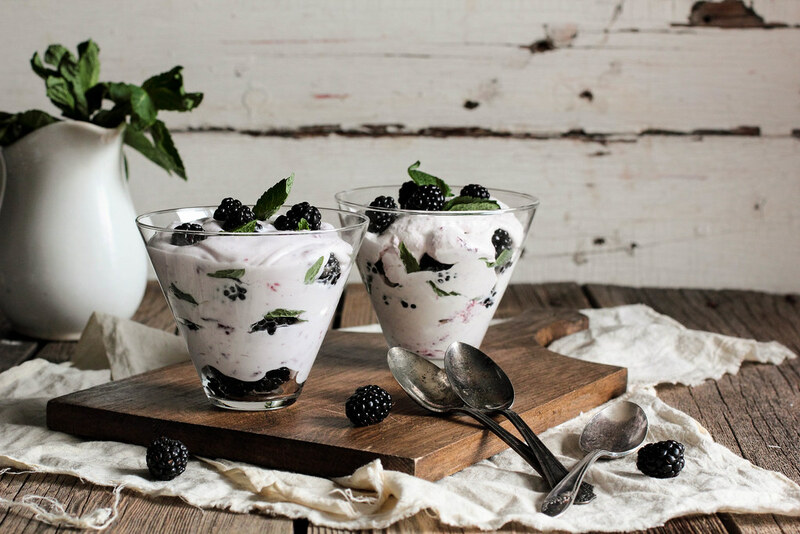 Blackberry Fool is a light, sweet ending to a spring or summer meal. 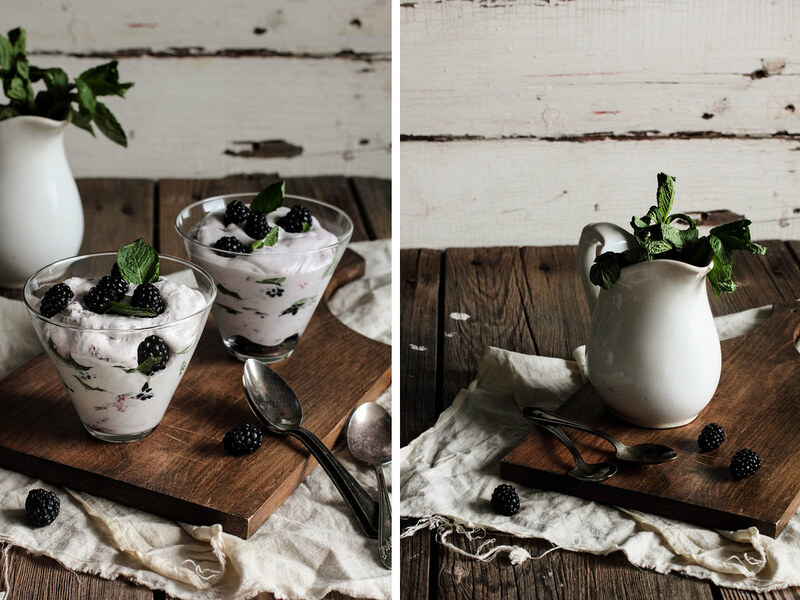 Seedless blackberry jam is folded into whipped cream and layered into a glass with fresh blackberries. 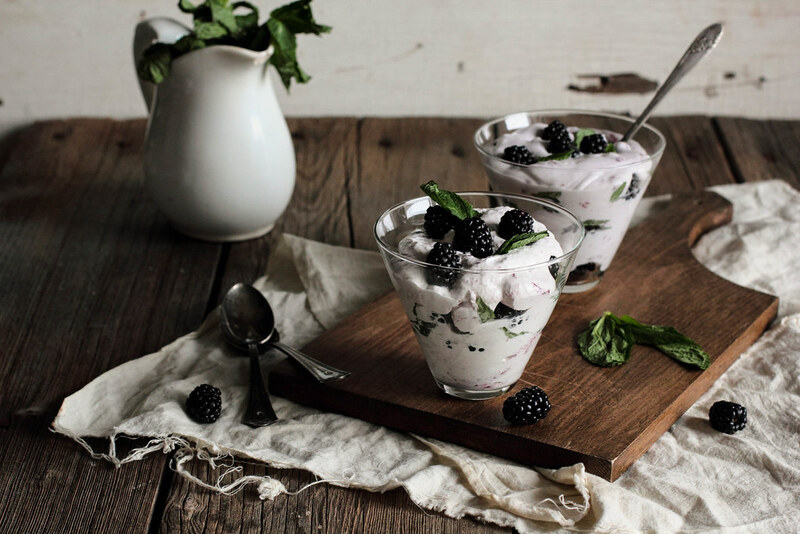 The contrast between the sweet bite of the berries and the smooth quality of the whipped cream makes the dessert simple, yet elegant. This traditional English dessert can be served for a small dinner party or an evening that calls for something special. Yesterday I was flipping through a cookbook when I stumbled upon a beverage recipe for a Minted Lime Licuado. A quick perusal of the ingredient list assured me that this drink was definitely something I was going to want in my belly. 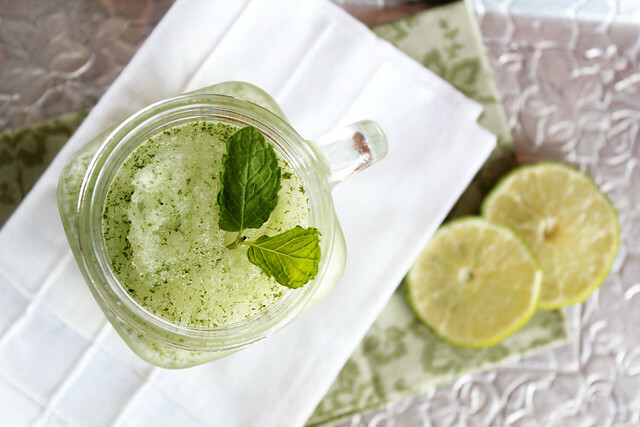 Mint, lime, and crushed ice come together to make this iced drink—really, what's not to love? Still, one question remained. What on earth was a licuado? Thank goodness for the internet and it's infinite source of wisdom (some days I'm really not sure what I'd do without it). After a quick search, I found all I needed to know. A licuado is a popular Latin-American drink that is slowly forging its way into American culture. Typically made with milk, fresh fruit, and ice, you can think of it like the Latin-American version of a smoothie. However, they are not to be confused with the smoothies we know and love. Licuados are much healthier, have a thinner consistency, and contain much less sugar than the conventional smoothie (who knew?). Licuados can also be made with water instead of milk, which brings me back to this particular licuado. 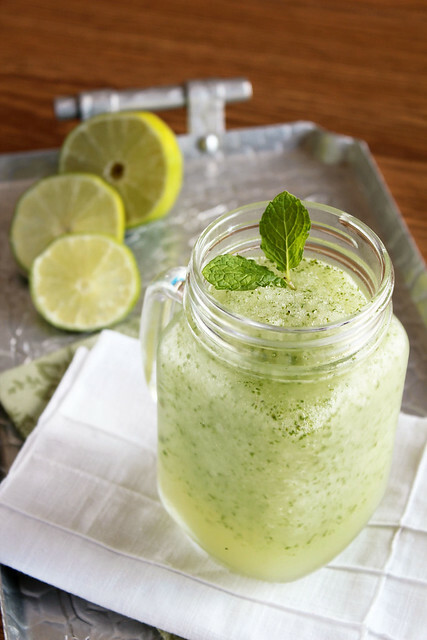 While definitely not an "authentic" recipe (I'm fairly certain using frozen limeade concentrate is considered blasphemy to the traditional licuado), it makes this drink a snap to make. I think a drink that is this delicious and simple to prepare is something we all can get behind, authentic or not. 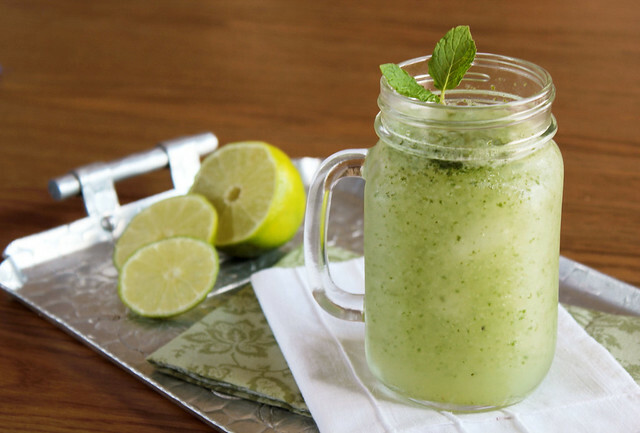 This Minted Lime Licuado is cool and utterly refreshing. Reminiscent of a mojito without the alcohol, the flavors of the lime and mint blend together beautifully. The crushed ice gives this drink texture and keeps it cool long after you start drinking. This drink would go perfectly with a side of chips and salsa and the next sunny afternoon.